This will set an initiative to an archived status. You can view it at anytime by searching for archived content, but it will be out of your day to day views. Keep in mind that this does NOT archive the content within the initiative. 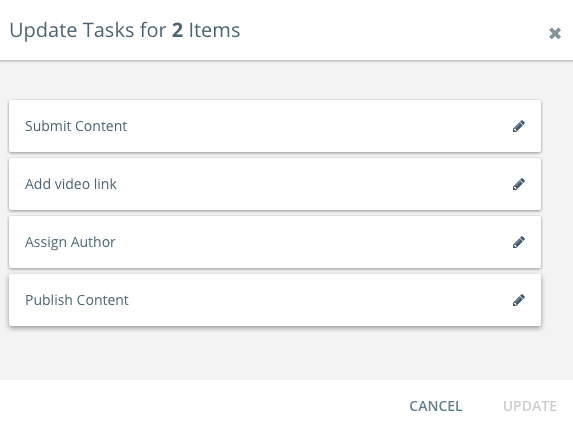 You'll want to use the bulk actions in the content catalog to do that. This will allow you to duplicate the initiative, all the content inside of that initiative, the field tags/values, as well as files to recreate a particular initiative/campaign in the future. This can't be undone so be careful! You should consider deleting an initiative if it was created by mistake, is a duplicate, or will otherwise never be needed for future reference. Choosing the archive feature is a great alternative. 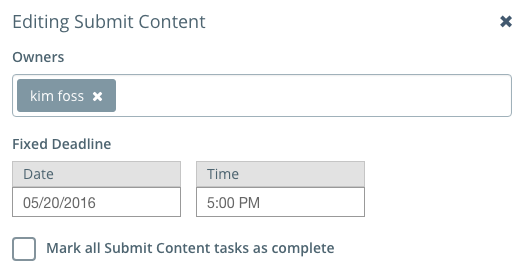 This feature allows you to tag your Initiatives with values in bulk! Choose Add Field Tags and then as many fields and corresponding values as desired. You can select the optional checkbox to override all current tags for the fields, if necessary. This erases existing tags rather than just adding new. This allows you to update your initiatives to be planned, in progress, or complete in bulk. Be sure to select the initiatives you'd like to adjust and then choose set stage under the bulk actions menu.